Last month I needed a quick idea for my son’s kindergarten party. We decided on a snowman theme, so I thought snow man snacks were in order! There are a lot of cute snowman-themed snack ideas around, but they’re all so complicated. I don’t want to hand draw faces onto marshmallows, tie licorice whip scarves or even stuff an orange mike-and-ike in a doughnut. I just wanted stuff I could stick in a bowl and eat. So I had our designer whip up these cute printables and after I posted a picture on Instagram and offered to share them, lots of you emailed me. What I hadn’t predicted, was that 90% of those people were hosting “Frozen” Snowman-themed parties. I have three sons, so we saw the movie, thought it was cute, and that was that. Apparently if you have daughters, they are in full-on Elsa mode and planning parties around her sidekick. Since according to the weather report on the national news, winter is still in full swing, I figure lots of you could still use these. They make an especially great little snack/activity for play groups and preschools, too. Enjoy! The water bottle wraps are sized for the little mini bottles of water. They’re half the size of the standard ones and so perfect for little hands. Costco sells them, but not all Costco stores stock them, so you might want to call and check first. One of the stores in my area had them, the other didn’t. You can often find these little bottles at office supply stores, too. Just a tip: when you’re cutting these labels out, cut them horizontally across the whole sheet, but don’t cut off the short ends. You’ll see what I mean when you look at the sheet. 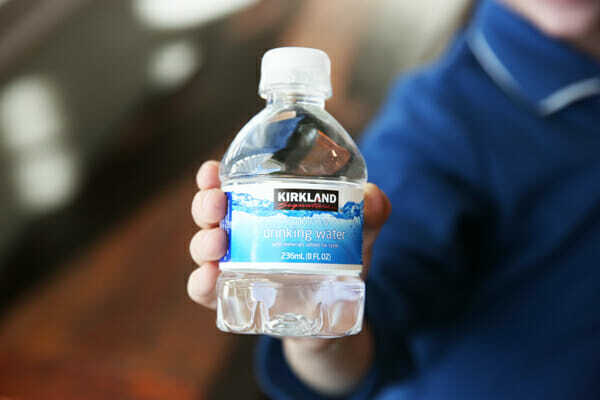 You’ll need the full width of the paper to wrap around the bottle. There are two different sets of individual cards, these are my favorites, but there’s also a sheet made like the very first image in this post, with a snowman in the middle of all the signs and the little “parts” in the corners. You can get creative here- in fact I’d love to hear any ideas I don’t mention! 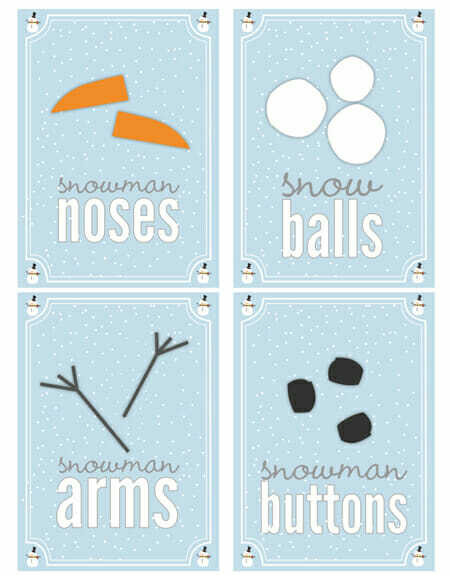 These are just meant to be cute, not to actually “build” a snowman. Just a fun play on words. 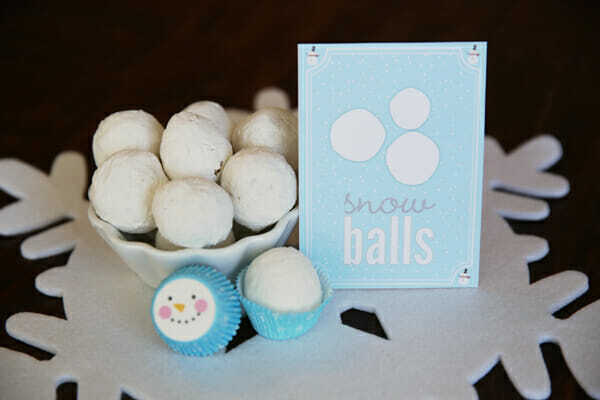 For the snow balls, I used powdered doughnut holes (and that was by far the most popular item at our party!) Marshmallows would also be an easy option. This isn’t the right item at all, but I was out of stick pretzels! Obviously use the sticks. For the buttons, anything little and brown will work. Chocolate-covered raisins, chocolate chips, Jr. Mints, Rolos…I used Whoppers. 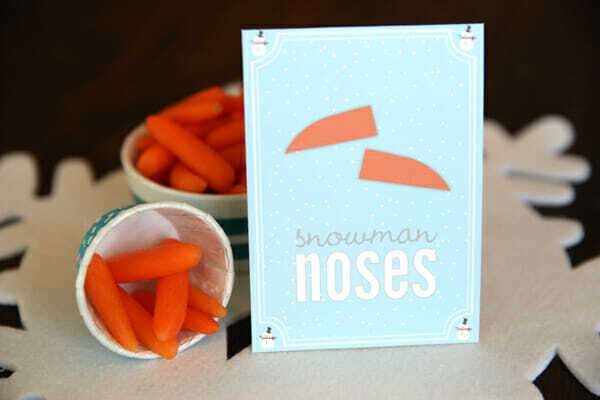 And since it’s all about balance (especially with the little ones) Carrot noses are little baby carrots. A great way to serve these for little fingers is to use little cups- you could use a small dixie cup, a treat cup (like photo’d) or check the aisle of the grocery store with the foil and plastic bags for little disposable plastic snack containers. They’re smaller than a muffin cup and perfect for stuff like this. Squirt some ranch dressing right into the cup and then add a few carrots. It’s a fairly non-messy way to serve carrots and ranch. That’s it. For little mouths, it’s a good amount and variety for a little snack. Have fun with it! Here’s an image for pinning- hover your mouse over that image for the Pin button to appear! If you haven’t checked out the new Shop yet, click on over and take a peek! Snowballs, Lisa SNOW BALLS. 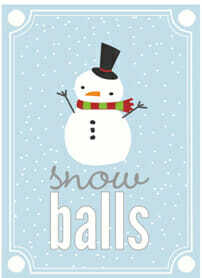 Very different than Snowman balls, haha! Good thing kindergarteners don’t have the minds we adults do, right? Lol! 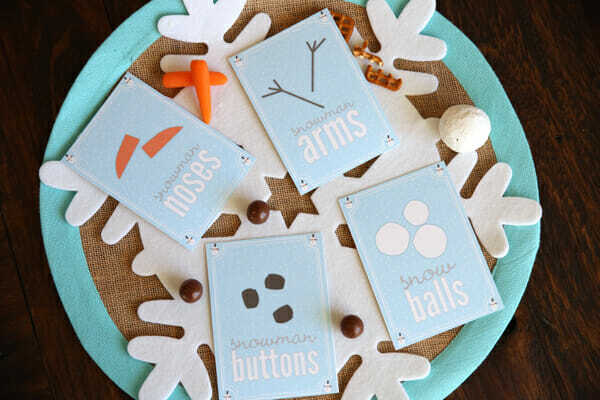 What a fun idea, and the printables are super cute!!!! Thanks for sharing Sara! How many ways can I/we say “thank you,” and “you two are amazing/creative/wonderful/fun/generous/loving/” …. Maybe you could have a contest for the best Sara and Kate List of Compliments? You deserve that ego-boost (not that you need one though). 🙂 I thank my lucky stars that I found you each time I read your posts. Happy New Year! Oh Linda, you are officially hired as our personal compliment-giver, haha. You’re too sweet. Happy New Year to you, too! THANK YOU!! 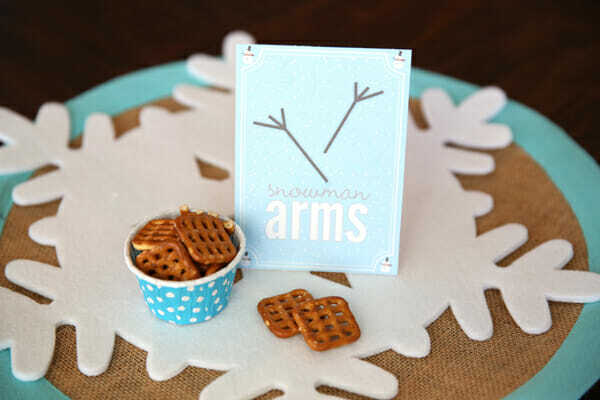 I am one of the many moms hosting a Frozen party – my daughter’s 7th birthday next week – and these ideas for treats are completely perfect and way less time consuming than the other ideas floating around on pinterest. Yay! I hope your party is a blast, Heather! My 3-year-old daughter went to a snowman party once and brought home a bag of SNOWMAN POOP! It was a little bag of mini marshmallows with a [hilarious] poem. This is just perfect because I was going to have a snowman party in a few days! My 3 year old keeps telling me everyday that we are having the party that day, so I just need to pick the date and print these! :0) Thanks again for all the fun ideas. These are absolutely adorable, Thank you! Seriously, you ladies are the best! Haha, I’m glad you like that. Trust me, I do stupid imperfect things on a VERY regular basis! My sister is planning a snowman party for Jan 25. This is way too perfect. There you go again, reading my mind! I’m going to have to start being very careful about what I’m thinking so as not to ever embarrass you the next time you go reading my mind! Oh yes, my 5 year old daughter is in full-on Elsa mode! I’ve been pinning ideas for her upcoming birthday and this just fits right in. Hope no one minds that her springtime birthday has a Frozen/snow theme. 😉 Thanks so much for these! You have amazingly great ideas! I will be using these perfect printables with my Kindergarten class after our Christmas break. Thank you so much for sharing these. God has blessed you girls with wonderful creativity and generous spirits! Thanks again for sending emailing the printables to me! They were perfect for the Jr. K class Frozen party I did! As a mom of 2 little girls, I can absolutely agree with what you wrote. We are full-on frozen fans with the soundtrack memorized! But the boys in the class had all seen the movie too and were very excited about the frozen matching game and the Olafs we made! Though they weren’t as into the sing along. Let it goooooooooooo…. For the water bottle printout….did you print those on label paper(if so where did you find that size) or just card stock? This just saved me so much time…. I think I love you. 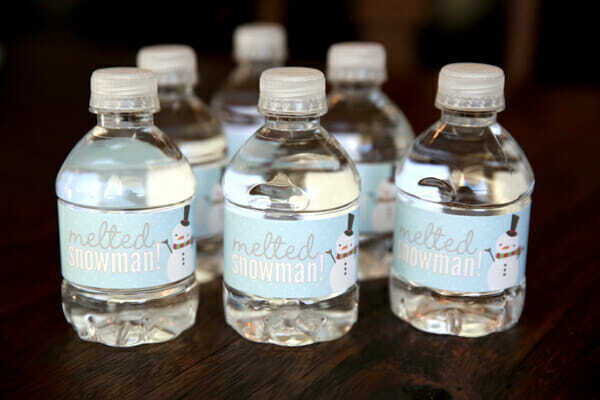 Thank you for the melted snowman printables! I just printed them out on card stock and taped them to Costco mini water bottles. Worked perfectly and super cute. Can’t wait for my son’s 3rd grade class to see them at their class party tomorrow! Thank you! !